Welcome to our Elite Eight voting! On Friday, we announced our Elite Eight (See all of the Elite Eight bundles here. ), giving you the weekend to carefully consider your favorites. Today the voting begins! Check out the bundles below and vote in the comments; you can also vote a second time on Instagram (@pbstudiofabrics). Have fun! Our event features 16 designers' carefully chosen palettes from the Painter's Palette Solids collection, competing in a bracket like basketball's March Madness. The fabrics? 168 different colors of silky smooth, soft 62 square weave solid fabrics. See them all here. "Even though this madness is happening in Spring, it's also the month of the Paris Fall Fashion Shows. I fell in love with all the colors being shown by the house of Gucci, and pulled from the hues from the clothes that walked the runways this month. They are a rich combination of red, pink and teal with a pop of periwinkle, fresh melon and citrusy green. They are all Guccilicious!" "I used to drive by a house on the way to visit my family that was painted mustard with cream trim, and teal shutters. I thought that color scheme was genius, and have been wanting to translate it into fabric." "The inspiration for this bundle came entirely from a shirt worn by a man sitting in front of me in church. It was a plaid shirt in shades of magenta and gray, and the fabric had such a beautiful sheen that I wanted to ask him where he bought it. These colors are a little different than the ones I normally work with, but I find them exciting and soothing at the same time." "Bird of Paradise was inspired by warm lush colors with a flash of green for fun and silver to make it all glow. 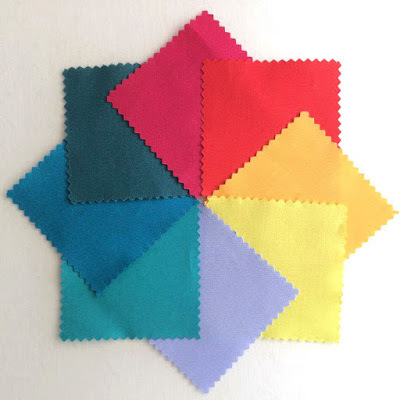 Normally, I gravitate to cool colors - greens, turquoises, blues, but lately I've been looking at a lot of quilt inspirations with warm citrusy colors. When this bundle of Painter's Palettes Solids arrived - I pretty much squealed - they are gorgeous together!" How to vote: Today we're featuring two games. Look at the bundles and choose your favorite for each game. Leave a comment below with your picks for both games. Please list the bundle name and the name of the bundle creator, as we have several duplicate names and want to make sure your vote counts. You can also vote on Instagram (@pbstudiofabrics) by leaving a comment. Please vote only once per game on each platform. Voting for these two games is open from 7 am EDT on Monday 4/3 through 6:59 am EDT on Tuesday 4/4. Voting for these games is now closed. 1. Tourmaline and Mustard Seed by Christine Perrigo. 2. Birds of Paradise by Shelley Brooks. I forgot to enable my Google+ profile. Which is basically empty but now my name shows up. game 1: guccilicious by elizabeth eastmond game 2: birds of paradise by shelly brooks. Very beautiful fabrics. Love the color combos! Game1:Tourmaline and Mustard Seed by Christine Perrigo. Game2:Birds of Paradise by Shelley Brooks .